We don't know what went wrong on the zombie train to money town, but apparently some marketing genius started to think in very scientific terms related to anatomy. Apparently their new packaging can camouflage their product from the prying eyes of the un-dead. Don't get us wrong we can get the concept of catering toward a good zombie massacre and LaserLyte puts out some great products, but lets not get overly complicated when trying to sell something with a hideous neon green. Here is some of the print from the latest marketing put out by LaserLyte: "Since Zombies are mono-chromatic deficient and cannot see this particular shade of green, the packaging hides the LaserLyte products from roving bands of Walkers. 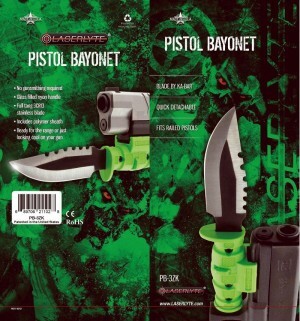 And on the same glow-in-the-dark note, the packaging will allow remaining survivors to quickly identify their much-needed LaserLyte lasers for their Ruger LCPs and LC9s and Kel-Tec’s .380, .32 and PF9s and “the last resort” serrated Mini-Survival Knife pistol bayonet." I don't remember zombies having the mental fortitude to seek out a weapon or component for individual use. They have mouths with teeth that chomp brains. Lets be level headed here folks and not let the gold stream of zombie blood impede our sensibilities. Sure you can put out a great product and slap a zombie tag on it... What the hell am I talking about, people are just going to buy it up in droves. As you were LaserLyte, as you were.